Patterns. They are the material weaved to make the intricate fabric of the universe. The one guiding the threads is the one teaching the 12 chosen children to recognize the complex design within the fabric of time. Each stitch aliens the essential elements of the story, revealing the intended pattern to be followed. Owr, the master creator, has tucked the invisible into the hem of the visible, allowing the children to peek between the tightly drawn threads to study how the spiritual affects the physical. The Eternity’s Account series continues – beyond the creation, the inception of evil, the fall of man, the division of kingdoms, and the fusion of dimensions. As the children tug on the seam of the cosmos, a new set of patterns is exposed. They prepare to witness the next stage in the saga; the rise of the rulers and the effects they will have upon the fate of the universe. 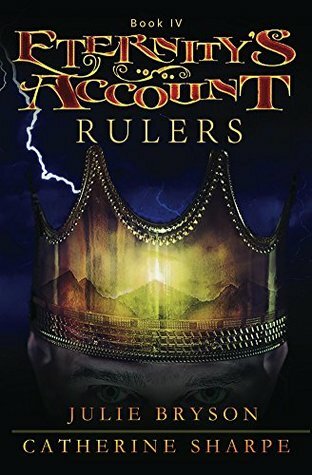 Eternity’s Account: Rulers by both Julie Bryson and Catherine Sharpe. This novel was different to many others in the way it was written. It combined fantasy with biblical elements. Intriguing and creative, this book hooked me. The themes in this tale such as evil versus good are clearly seen. The scenes were vivid. Characters were interesting. I found the entire book to be complex, entertaining, and diverse. Darker than most Christian reads yet more engaging. The characters pulled me into their fictional world. There was enough action to keep me turning the pages. Overall, I would recommend this to fantasy lovers.